Billiards racks are pieces of sporting equipment used to place the billiard balls (to ‘rack’ the balls) into their starting locations for a game of pocket billiards. The two most popular variations of billiards racks are the triangle (Eight-ball) and the diamond (Nine-ball). Triangle racks have inner dimensions of 11.25” | 28.58 cm by 10“ | 25.51 cm and diamond racks are 6.75” | 17.15 cm by 10“ | 25.51 cm. Billiard racks are made out of a variety of material choices that commonly include wood, plastic or metal. In eight-ball billiards, 15 balls are placed in the triangular rack with the eight ball in the center, the one ball at the apex, and a solid and stripe as the other two corners. 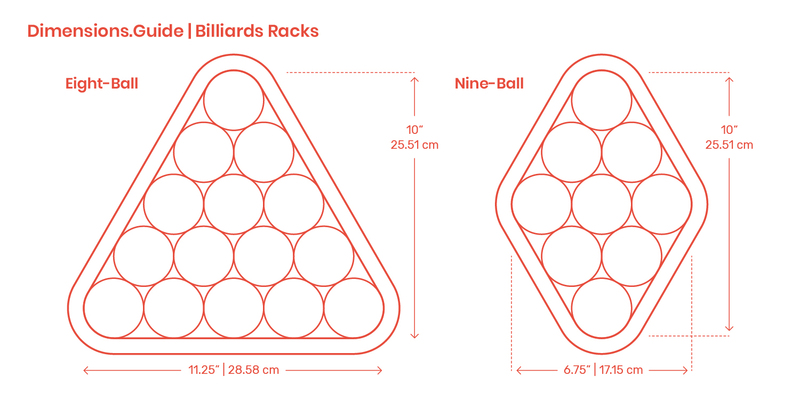 In nine-ball billiards, balls one through nine are placed in numerical order (left to right) in the diamond shaped rack started from the apex.